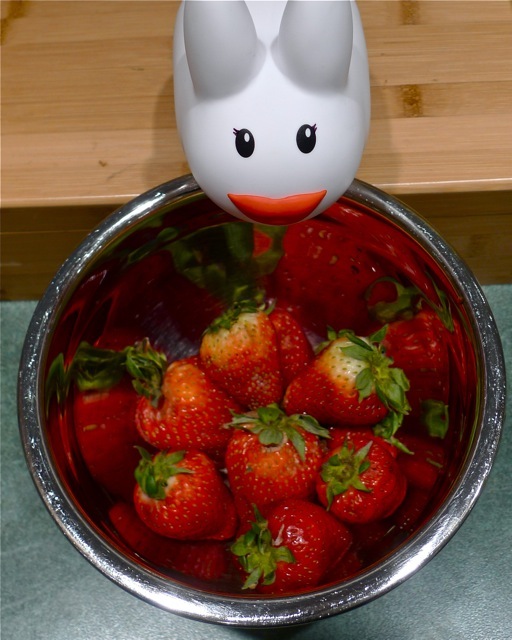 The labbits are so unbelievably happy that their CSA with Deep Meadow Farm has started for the season, and the first of the arugula is peppery and so so so fresh! 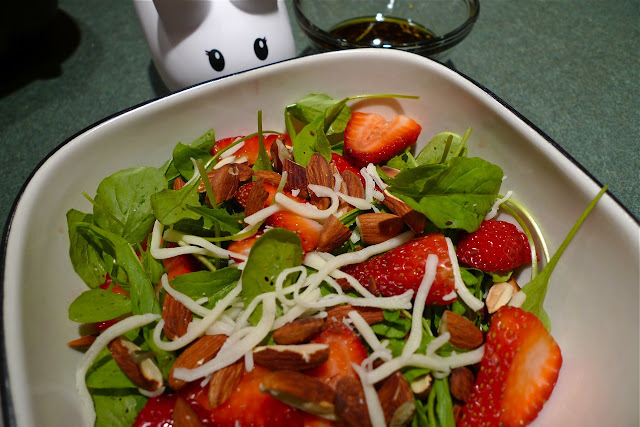 Strawberries are a nice complement to arugula (and the color inspired Clover's lipstick shade). 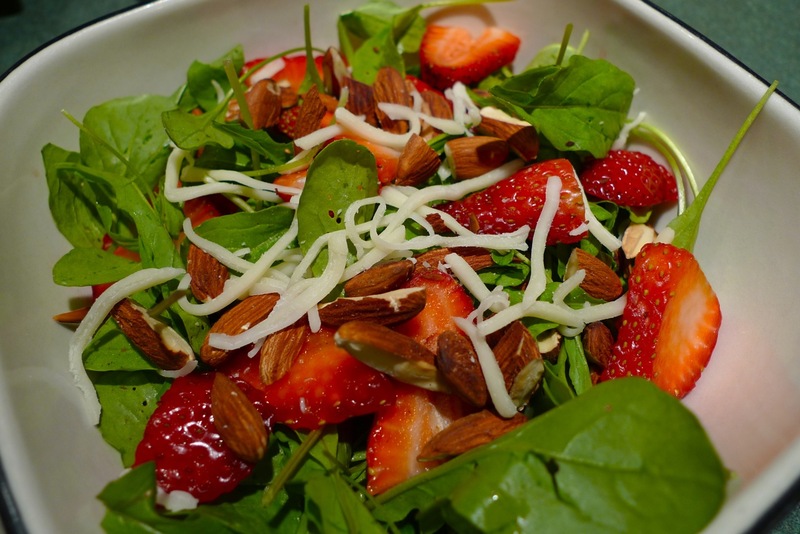 Toast up some chopped almonds, shred some fresh mozza, and you've got a tasty spring salad. For the dressing, you can cook up some salad grade balasamic vinegar and add olive oil. Flavor with orange zest and a pinch of ginger and you've got a fabulous homemade dressing. Print the salad recipe here. Toss arugula, strawberries in a large salad bowl and top with shredded mozzarella. 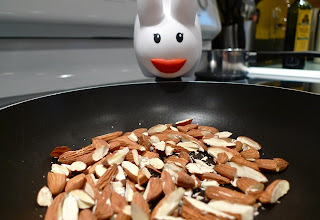 In a dry pan over low-medium heat, toast the almonds, occasionally shaking the pan to toast evenly - about 5 minutes. Remove from heat and allow to cool slightly before tossing on top of the salad. 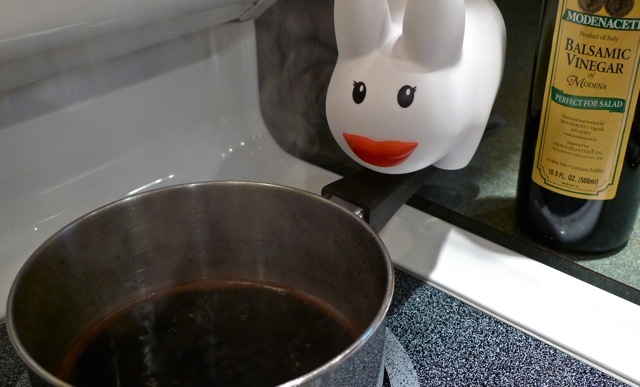 In a small saucepan bring balsamic vinegar to a boil, and continue to cook over medium heat until the vinegar becomes thick and syrupy, about 5-7 minutes. Remove from heat. 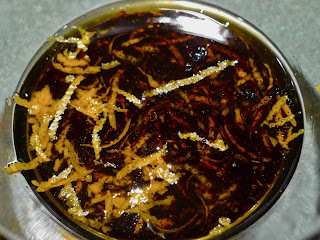 Whisk in olive oil, pinch of ground ginger, orange zest and S+P to taste. Serve salad and drizzle dressing sparingly over the salad (a little goes a looong way). Serves: 4 labbits as a starter; 2 as a main.